Today’s Budget Statement introduced a broad range of new measures and changes to the tax landscape. The headline announcements - and a reminder of the measures coming in from April 2016, April 2017 and beyond - are highlighted below. From 1 April 2016, the purchase of buy-to-let residential property will attract a 3% surcharge over and above the usual rates of SDLT on purchases of second homes (“additional residential properties”). In addition, the 10% “wear & tear” allowance is also to be abolished from 6 April. For commercial property, a new SDLT rate system is to be introduced from midnight tonight. The first £150,000 will be at 0%; the next £100,000 at 2% and above £250,000 will be 5%. The major change to the taxation of dividends announced last year will come into effect from 6 April 2016. The rates of tax applicable to dividend income will increase by 7.5% at all income levels, although this is mitigated to a certain extent by a new £5,000 tax-free allowance for dividends. From 6 April 2016, the rates of Capital Gains Tax will reduce from 18% to 10% for basic rate taxpayers, and from 28% to 20% for higher rate taxpayers. It is important to highlight, however, that the old rates of 18% & 28% respectively will continue to apply to gains on residential property. The tax payable by close companies on new loans or advances (made on or after 6 April 2016) will increase from 25% to 32.5%, in line will the new tax rate on dividends for higher rate taxpayers. As previously announced the annual pension allowance is to remain at £40,000, however, for those earning more than £150,000 per annum, the pension allowance will be tapered down to a maximum of £10,000 for those earning £210,000 or more. Entrepreneurs’ Relief is to be extended for long term investors who subscribe for new shares (after 17 March 2016) in unlisted trading companies and hold these for three years. There is to be a separate lifetime allowance of £10M available. A restriction has been introduced to the CGT exemption on the disposal of ESS shares, acquired after midnight tonight, to a lifetime exempt amount of £100,000. A restriction on the tax-deductibility of mortgage interest payments for private landlords will be introduced from April 2017 and is to be phased in over four tax years up to 2020/21. A new Lifetime ISA is to be introduced for adults under 40 at 6 April 2017. Individuals will be able to save up to £4,000 per annum and receive a 25% bonus from the Government up to the age of 50. The corporation tax rate is set to fall to 19% from April 2017 onwards. In addition, new measures will come into effect from April 2017 onwards applicable to large corporations (i.e. those with profits in excess of £5M per year), restricting the deductibility of losses from earlier years and also the deductibility of interest costs that are allowable. From 2018 Class 2 NIC for self-employed will be abolished. There will be a consultation regarding Class 4 NIC, which are also paid by the self-employed, to consider how to build entitlement to the State Pension and other contributory benefits which used to be covered by the payment of Class 2 contributions. The corporation tax rate is set to fall to 17% from April 2020. It was previously announced that corporation tax would reduce to 18% from April 2020. If you would like to explore what today’s Budget Statement could mean for you and your business, please call 020 7731 6163 to talk to one of our tax team. Taking a family stroll to new limits! Whilst most families were enjoying the early spring sunshine this Valentine’s Day, two Warrener Stewart families were fighting it out on the Thames tow path, running the Craven Cottage 10k race. The race, now in its third year, follows the river from Craven Cottage (famous home of Fulham FC) up to Hammersmith Bridge and Barnes, then back via Putney Bridge. left-right, Mike Collins & Jane Collins (David's Dad & Mum), Nick Morgan, Ricky Morgan & David Collins. Nick Morgan, Joint managing director of Fulham based chartered accountants, Warrener Stewart, was joined by his son Ricky. Team Morgan raced the ‘taxing team’ of Nick’s tax colleague, David Collins who’d enlisted his sprightly parents; Mike & Jane Collins. It was a very respectable showing all round with Nick’s son Ricky, finishing 8th in just 40 minutes; whilst David, just a quarter minute behind, came 9th. The popularity of girls playing football has grown, with female football now the biggest female team sport in the UK. Grass roots support is vital for the many teams who compete at local level. One team who are about to have the opportunity of a life time is Teddington Athletic FC’s Girls U15, when they fly out to Tampa, Florida. Whilst only recently formed in 2013, the girls’ team has gone from strength to strength with the help of many sponsors, including breast cancer charity CoppaFeel! In a bid to give something back to their sponsors the girls are busy raising money to fund their tour to Tampa where they will be hosted by Tampa Bay United, the area’s largest soccer club. Their aim is to give a percentage of the funds raised to the charity to raise awareness of breast cancer in young women. In the latest round of the Association of Taxation Technicians (ATT) exams taken in November, Warrener Stewart had four candidates sit these professional tax exams; (l-r) Ryan O’Connor, Felicity Butler, Ashleigh Molton and Freddie Hollom. The ATT is the oldest examination board concerned solely with tax compliance, passing one of the stages of these exams demonstrates a professional standard and deep understanding of tax compliance issues in the UK. “In addition to these passes, we will soon have another Chartered Tax Advisor in the tax team following Daniela Tripksa hard work passing her final CTA exam. This allows her to apply for her Chartered Institute of Taxation (CTA) qualification,” continues Damian. Figures released from Companies House showed that 2014 was a record year for people taking the leap to start their own businesses, with 581,173 companies registered alone in 2014. As London based chartered accountants, Warrener Stewart can testify, enquires from start-up businesses has doubled in the past 18 months. Many of their new clients are keen to start a new business based around some of the simplest of ideas. Indeed, inspired by an already successful pudding maker, one client saw an opportunity with their own take on chilled, potted deserts. Together with a handful of local associates and investors, Fulham based chef Julian Dyer, founded Pots & Co, turning to Warrener Stewart for their accountancy and financial advice to help develop the company’s foundations. Pots & Co has gone from little pots to large contracts in just under three years. Having already secured distribution with Waitrose, Tesco and Selfridges, the Acton based pudding maker recently won a contract to supply their handmade puddings to British Airways and Delta Airlines. 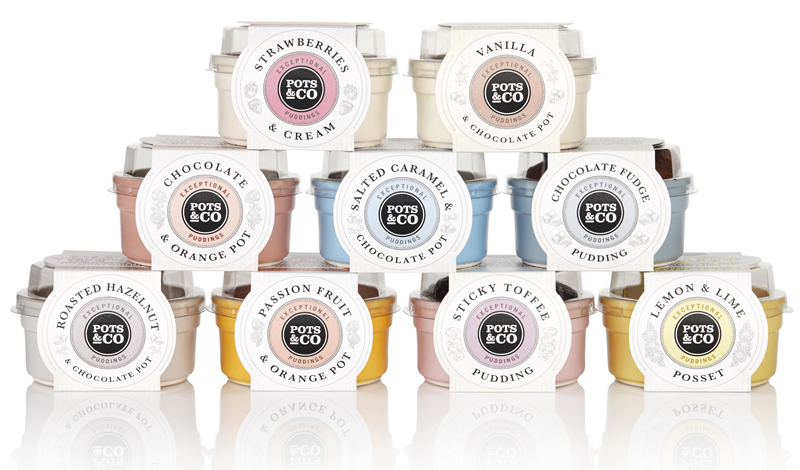 This latest contracts will help increase Pots & Co’s revenue from £2.7m to £8m.